Old map by BRITISH ADMIRALTY CHART. 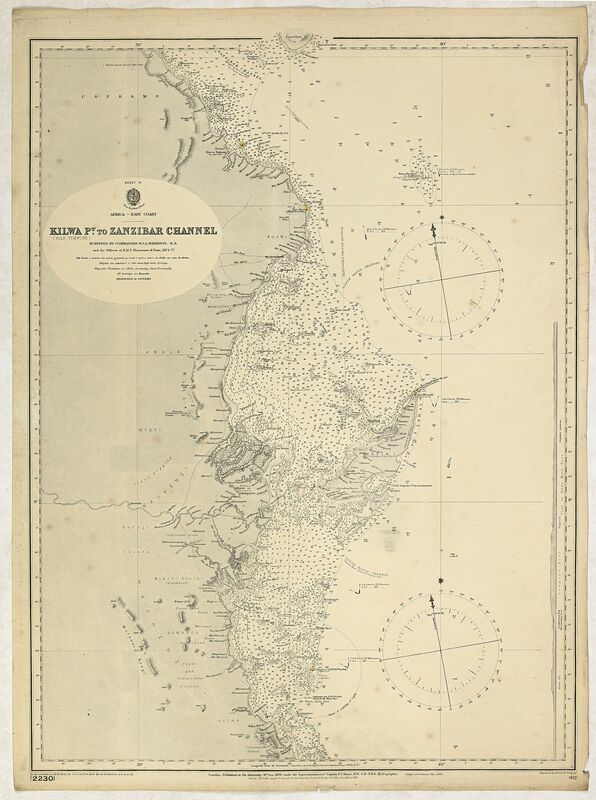 - Sheet IX Africa east coast Kilwa P.t to Zanzibar Channel Surveyed by Commander W. J. L. Wharton… , F. J. Gray, R. N., … 1874-77… Magnetic variation in 1900, decreasing about 2' annually. Title: Sheet IX Africa east coast Kilwa P.t to Zanzibar Channel Surveyed by Commander W. J. L. Wharton… , F. J. Gray, R. N., … 1874-77… Magnetic variation in 1900, decreasing about 2' annually. Condition: Paper slightly age-toned as usual. Light houses in yellow and red. A few tears along margins. A fine Hydrographic Office chart no. 662 (2230), showing the coast from Kilwa P.t to Zanzibar Channel. Engraved by Davies & Company. London : Published at the Admiralty 31st Jan. 1876 under the Superintendence of Captn. F. J. Evans, R.N. Hydrographer : Sold by J.D. Potter agent for the Admiralty charts, 31 Poultry & 11 King Street, Tower Hill".